Construction on Cragsmoor’s landmark Stone Church was begun in 1895 under the supervision of John Keir, a Cragsmoor resident. Nearly two years later, on June 19th, 1897, the 900-pound bell in the tower was finally raised. A Latin inscription on its side reads “In Honor of the Blessed Trinity and All Saints 1897”. The first service was held the next day, Sunday the 20th. The chapel, built of stone from the mountain, was designed by Frederick S. Dellenbaugh, an architect and prominent Cragsmoor resident. In memory of his wife, he also donated the rose window, which replaced an earlier version blown out in a storm in 1909. The inscription reads, “Her Smile Was Like a Benediction.” The window was designed and executed by Lamb Studios in 1932. The Stone Church was a part of a community built by Eliza G. Hartshorn of Newport, Rhode Island, modeled on the Hospice of St. Bernard in Switzerland. The first buildings included “Rhuberg” (“Mountain Rest”), still standing to the immediate west of the chapel, and several other buildings used in the summer months by an Episcopal lay order, the Brothers of Nazareth, who cared for the sick and the deprived. Mrs. Hartshorn was introduced to the order by Father Daniel I. Odell, the rector of a church in Rhode Island and later the rector of the Church of the Annunciation in Philadelphia. 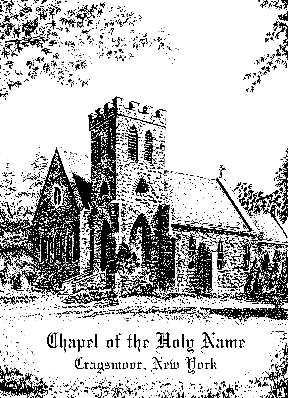 Father Odell and Mrs. Hartshorn planned the Stone Church to serve the Brothers of Nazareth as well as the entire Cragsmoor community. In early years, 15 worship services were held each week during the summer months. Mrs. Hartshorn, who died in 1916, passed ownership of the chapel to Father Odell, and he in turn transferred ownership to the New York Alter Guild of the Protestant Episcopal Church in 1922. In 1945, the chapel became the property of the Episcopal Diocese of New York. The Chapel of the Holy Name is not a parish church, but it maintains a vibrant program of worship under the leadership of Friends of the Stone Church, lay volunteers who live in and around Cragsmoor. Services are held every Sunday at 11:00 a.m. from Memorial Day to Labor Day and on the first Sunday of each month during the remainder of the year. In addition, the chapel is available for weddings and other events, the funds from which are used exclusively for the restoration of the building and the grounds. Any contributions toward the restoration of the chapel are appreciated.